Model T Ford Forum: He said "This is a '23 TT"
He said "This is a '23 TT"
Model T Ford Forum: Forum 2015: He said "This is a '23 TT"
Came across a fella who claimed this was a '23 TT. Having the squared off body & quarter windows and never seen the like before, my real question is whether this was really just an altered coupe body? The bed/box looks too long for being a pick-up. Well, that's one closed-cab TT that might actually have some leg room in it! Often done in the days before Ford offered a body on the TT chassis. 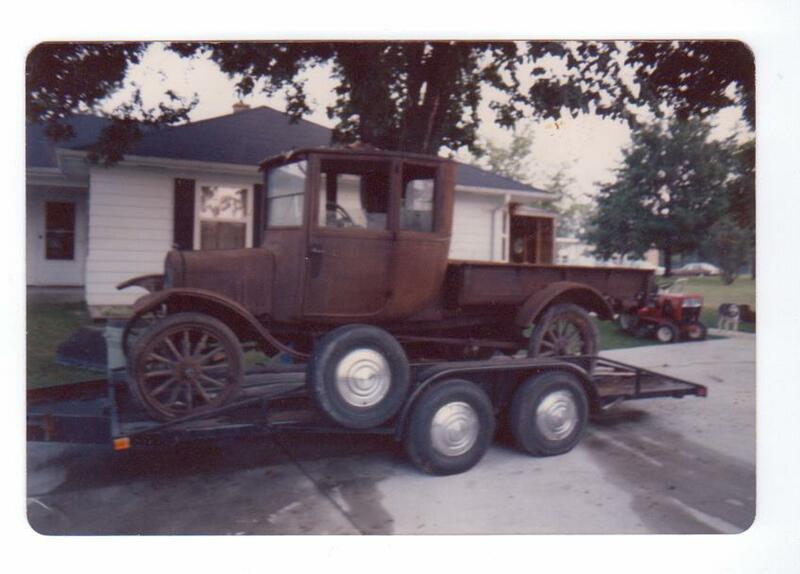 I remember my father having a TT chassis with a 1915 runabout body on it. Looks like Ford was the first to have an extended cab truck. As David said, the bed looks TTish. But it is odd. That coupe body would take up more space behind the firewall than a TT closed cab, so if it is a TT bed its mounted further to the rear than it ordinarily would be, and yet the fenders are located over the wheels. There was one just like that on both CL and EBay about a year ago. It was up in Maine. Really wanted it, but missed the bid on it. I believe those are TT radius rods on the rear but are not hooked up to the drive shaft. Car wheels on the rear. I think it is a extended car chassis myself. If someone else's photo soft ware is able,zoom in on the rear axle. the front running boards are short which would point towards TT. But the frame does not look TT, it looks like a car chassis. Looks like a put together truck to me. I have to agree that the frame doesn't look like a TT frame. If there is a title for it I wonder whats on it and what year. The body is a '19-'23 Coupe with the turtle removed, and it appears to be a later TT bed. I think it's a TT chassis, but it's difficult to say since part of what we need to see is underneath the truck in shadow. It could be an extended car frame, but it looks like a TT rear end. I'm guessing TT chassis with the car body added. Whether it's a car or truck frame, its length could have been altered to suit. I think that the frame actually is TT. The rear wheels do appear to be car but the 23" TT rears sometimes can look like car wheels particularly in a fuzzy photo. The bed is an express bed as is stated above which the front fenders were moved ahead on. You can see a notch on the forward end of the inner edge of the fender. This notch should line up with the center brace on the bed. It is obviously the first F150 Super Cab. If it's a TT chassis doesn't that make it the first F350 Super Cab? Probably another goofy contraption someone put together in the early '70s. It's certainly nothing Ford built. Packard that got the "Farmer Brown treatment" in The Depression. You're correct Marv. No splash aprons on TT's, at least not from the factory. So does your posting indicate it's now a hot rod? That would be a shame, such a unique piece of "Yankee Ingenuity." mashed components, and yet it is just that much more cool because of it. David - My understanding is that he had kept the title to use for a hot rod, and sold the rest. Supposedly, it went to a guy down around Fond du Lac, which is about 80 miles south of me. He would not give me any contact information. Burger - The TT's do present a different, yet classy 'attitude' than the cars. I feel very fortunate to have "My Dad's Legacy" also out in my shop.... The One-Ton '26 steel stake-bed, much like photos I've seen of your TT. Interesting, so he kept an original car's paperwork to title a Hot Rod. No wonder the DMV offices are suspicious of us. A Hot Rod should get an Assembled Car title!!!! This is one of my pet peeves, sorry! I think it's weird he won't give you any info on who purchased it, maybe he's afraid of anyone re-titling the truck using the original numbers??? Well, thanks for sharing the pictures, looks like it would have made a great truck/survivor. David D. is spot on about the (supposed) title information. Most of the folks at the DMV's don't know squat about old cars and something like this comes along and really makes their head spin. In reality the supposed truck? in question is really an assembled vehicle and would fall in that category. But who at the DMV would know that. Unless you told them?? Why all the negativity about this vehicle? The entire time that Ford was producing that Coupe body style, the were also offering the TT as a chassis only. Ford didn't start selling the TT with a cab until '24. The fact that someone opted to install a Coupe body, perhaps when the the TT chassis was new., shouldn't be a problem for us today. Obviously it's an assembled vehicle and through experience I can tell you even if it was Factory built most DMV's wouldn't have the foggiest notion. From what I've read here concerning the possible use of the paperwork by the seller is just another reason not to buy a car without a title. Hope the buyer knows the situation clearly. The coupe, OTOH has much more leg room and comfortable seating, so. . . . If the price was right a way to solve this curiosity is to turn it into a Coupe pickup. There is an earlier thread about a 26 Coupe that was turned into a pickup. The Coupe body looks to be fairly decent. Mount it own a car frame and add a T pickup bed to it. Use as much of it to go with the transformation and sell the rest. Redoing it this way would make a neat Coupe that you could drive and have more value in the long run. I've considered but never acted on putting a TT together from pretty much scratch. Of course I'd want to start with a titled basket case, then go from there so title and registration would not be a problem. It would be mechanically the equivalent of showroom new, have a roadster body cab, a Ford TT express bed, a new Warford, Ruckstell, high speed rear end gears, Bennett Brakes, exhaust cut-out, and whatever else I might think of along the way. Of course the problem is that I'd probably spend $30,000+ to build a $10,000 truck that purists would laugh at. That is one neat looking truck. Good vision of space as well.